I go to my porch turn on the light at the switch…. look in MControl and it still shows the switch as off. My question how would I link a switch to the PLC so that I can get it’s status? I am a n00b so go easy on me step by step would be great. I don’t want to anything fancy just be able to have the status show up in MControl. Thanks for any help! Hi, you have two ways you can do this, first is using the TAP/Tap like if you were linking a switch to a device, in this case tap and leave pressed until the switch starts blinking then walk over to the PLC and press the button until the switch flashes once. And your set! 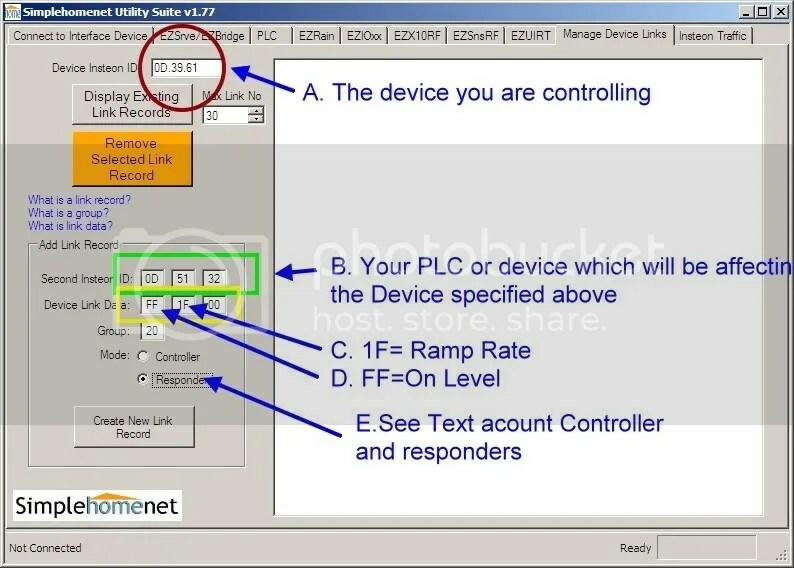 When using the commands you set the PLC as the ‘responder’ and each one of the devices as controllers, technically your telling the plc to respond to the on/off/dim commands, even thought we know it wont do anything, but it will see the commands. also the command will setup the appropriate ‘controller’ commands. Hope this help tell me if it works!